Chapter 31 is done! As I explained last time (for the 45,000-word milestone), this emotionally charged chapter was calling to me to write it after hearing a specific piece of music. The protagonist is overwhelmed with shame, guilt, and remorse about events from the preceding chapter, and faces a decision she wouldn’t have dared to make earlier in the novel. Also, one of the WIP’s main themes weaves itself into this chapter’s second half. This was a moving section to write and maybe one of my favorite chapters in the entire novel, so I’m extremely proud of it. Chapter 3 will be done once I’ve written one last scene to close it out and transition to Chapter 4. This chapter is… well, a mess. *lol* OK, that’s an exaggeration, but it feels that way right now. Chapter 3 is the longest chapter by far, most likely because I’m taking too long with the scenes that comprise it. This is a first draft, though. It’s meant to a word dump. When it’s time for Revision Round #1, tightening this chapter by condensing and cutting will be one of my priorities. Still working on some backstory and character development in my “appendices.” (Sounds like I’m copying Tolkein, but I don’t know what else to call them!) I especially had a blast writing my villain’s origin story and history. A lot of writing tip articles suggest that writers try to make villains and antagonists sympathetic, with motives, positive traits, flaws, and possible reasons for the reader to root for them. Based on what I’ve developed over the past few weeks, I can say with confidence that my villain is on his way to becoming such a character, and I’m thrilled about it – in a perversely motherly kind of way, if that makes any sense! With the 25,000-word milestones, I’ve promised to offer sneak peeks into of my WIP. I revealed in “Chronicling The Craft: 25,000 Words” that my protagonist is a member of the world’s Faerie species, and shared some of the cultural, essential, and magical aspects I’d created for their creed. Today, I’m going to introduce you to the protagonist herself through a character profile I wrote for my appendices. This character profile consists of two parts. First is a summary of the protagonist’s backstory, fears, motivations, etc. The summary also contains some plot spoilers, but I needed to include them for the sake of fully familiarizing myself with the Faerie and her character arc. Second is a list of the protagonist’s character attributes and flaws, developed with the help of Angela Ackerman and Becca Puglisi’s Positive Trait Thesaurus and Negative Trait Thesaurus, respectively. (I highly recommend both volumes, by the way! Click here for details.) With all of these elements, I hope it gives you a good understanding of who the protagonist is when the story begins and how she might evolve during the course of the novel. Eva is a young Faerie woman (a few weeks shy of 18 years old when the story begins) and the first female member ever elected to the Council of Selanaan, the Faeries’ peacekeeping fellowship. She lives with cousin and fellow Council member Gidion as well as her Aunt Maji and Uncle Lusan, who have raised her when she was 5 years old. Eva’s primary roles in the Council are translator and navigator; however, she’s also a versatile fighter and an exceptionally skilled kisena (a sort of Faerie sorceress). She carries twin knives and a sword, but her weapon of choice is a bow and arrow made by her uncle. She also has a heightened sensitivity to the presence of magical beings, and experiments and tests the limits of Faerie magic to save lives or for the sake of doing good. In Eva’s opinion, everything she does for the Council must be for the greater good of her people, not simply for her own advancement. Eva’s relatives raised her because Eva’s parents were murdered when she was 5 years old. Her parents were attacked during a family holiday by Mountain Men. Eva was also injured in this attack, suffering a torn left wing. The little Faerie girl was later rescued by the nomadic race of Krunicians, who healed her wing as she waited for relatives to come for her. Eva’s recovery was to her advantage: A torn or damaged wing is considered a sin in Faerie culture, and its only punishment is exile from the Faerie kingdom. While Eva’s injury was never confirmed or sighted by royalty, she still endured rumors and rejection from her peers as she grew up. She faced further scrutiny from her people when she shunned traditional domestic studies expected of female Faeries (cooking, sewing, clothes-making) for more “boyish” activities (hunting, games, fighting) and magic studies, and then when she was elected to the Council. Despite the physical and emotional scars, Eva is deeply loving and loyal to the ones she cares about. She confides in and is fiercely protective of her cousin Gidion. She also shares a special relationship with her Aunt Maji (a surrogate mother, mentor, and best friend), often butts heads with but appreciates her Uncle Lusan, and is the proud owner of the messenger bird Thrush and an enchanted horse named Immer. Eva prefers a simple lifestyle, choosing to live with few yet sentimental possessions. No less important are her close bonds with each of her fellow Council members – Faerie men and boys that she considers her adopted brothers. It may not surprise anyone, therefore, that Eva’s greatest fear is losing more of her loved ones from unnatural circumstances, just as she had lost her parents. This fear is what inspired Eva to try out for the Council in the first place. What the reader learns but the novel’s other characters aren’t aware of is Eva thirsts for vengeance for her parents’ deaths. For years she has secretly wished to kill any Mountain Folk who cross her path – a desire that breaks numerous Council rules, but one she keeps nonetheless. When the Council is tasked to join Aurek and his band of Mountain Men on their mission north, Eva is forced to question her prejudices and reexamine her morals. What she discovers is that some rules are meant to be broken for the sake of good, and love and forgiveness accomplish more than hatred can. The latter lesson is emphasized in Eva’s relationship with Aurek, the leader of her travel party. Because he’s a Mountain Man, Eva seizes the first opportunity she has to threaten his life. She later regrets her actions when she finds out that the Council will join the Mountain Men’s journey and, as the Council’s navigation expert, she’s tasked to lead the company north. Eva spends much of the next month (the journey lasts approximately 3 months) striving for Aurek’s trust, more out of genuine yearning rather than duty. Once Aurek drops his guard, Eva realizes how much the true Aurek differs from her warped perception of him. She increasingly seeks time with him and cares about his opinions. As the mission goes on, however, Eva begins to suspect Aurek may be withholding something from her. The truth, when she learns it, shakes her at her core and drives her to consider the unfathomable – both as a being craving for love and companionship, and as her own worst enemy. 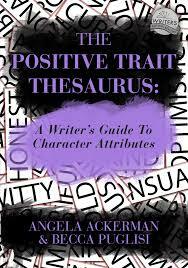 Cover of “The Positive Trait Thesaurus,” used as a reference in creating Eva’s character profile. Adaptable: Eva thrives on challenges and new experiences, and reacts to quickly changing environments and situations to keep her friends safe. She also learns from past mistakes and wills herself to recover from even the most heartbreaking setbacks. Confident: Eva believes in her abilities as a kisena, a Council member, and an overall protector. She works diligently in these areas of her life and uses her self-assurance and capabilities to find solutions to problems rather than become paralyzed with fear. She also compliments her Council brothers on their successes and is not afraid to ask for help or act independently. Cooperative: Though independent at heart, Eva has learned cooperation through her Council activities. She values the individual and collective talents of her Council brothers, respects their opinions, and enjoys the deep bonds she’s forged with each one. Eva also takes pride in the Council’s accomplishments together and sets aside her prejudice toward the Mountain Men so she and the Council can help them reach their goal. Courageous: Eva always faces danger and uncertainty with physical, magical, and internal strength. She also must summon her courage at the novel’s climax, in which she must confront an enemy she doesn’t know how to defeat yet understands she must try to at all costs. Creative: Eva is aware of her heightened magical abilities and explores those abilities by creating and improvising spells. This requires intuition, adaptability, and intense concentration, all of which Eva possess. Apart from magic, Eva finds beauty and wonder in nature and small things that other beings may take for granted. She also appreciates music and dancing. Decisive: Once Eva sets her mind on something, she sticks to it. She thinks on her feet to conjure new spells and never second-guesses herself. Her strong work ethic and confidence in her abilities aid her in making such decisions. Empathetic: Despite her tough, tomboyish exterior, Eva is a good listener and genuine friend to those she trusts. She enjoys taking care of her horse Immer and her messenger bird Thrush, and considers them among her closest companions. Eva is also deeply attuned to emotion and sensitive to the hardships of others, especially when she can relate to their experiences. Perhaps her underlying desire for true love and acceptance is what drives her empathy. On the downside, Eva sometimes finds herself overwhelmed by emotions such as grief or remorse, and is reluctant to share her feelings with others in such cases. Intelligent: The breadth of Eva’s knowledge spans geography, navigation, languages (every Great Island tongue), foreign cultures, and magic. She believes a Faerie’s powers are less limited than her people have been taught; and she exercises caution and respect when modifying or creating spells. When Aurek presents her with a map inscribed with ancient runes, she accepts the challenge and later convinces Aurek to visit the kingdom of Denelai so she can research the Great Isle’s largest scroll rooms and find out how to interpret the message. Loyal: Eva willingly puts her own life in danger to protect others, even if the act requires sacrifice or pain. Also, her deep friendships with each Council member and (once it develops) with Aurek allow her to express empathy when she relates to the situation at hand or defend a friend when she deems it necessary. Responsible: Eva takes her commitment as the expert navigator and linguist seriously, continually studying maps and languages to keep her skills fresh. Once on the journey north, she sets aside her disdain for the Mountain Men and charts the safest possible course. She also learns from a grave mistake she makes toward the journey’s end and uses that lesson to motivate herself for the novel’s climax. Passionate: Eva stands up for her beliefs, thinks independently, and is not afraid to express her opinion. She’s also self-motivated, determined, and sometimes stubborn. Eva also experiences emotions deeply, and becomes angry and confrontational toward Aurek and the Mountain Men at key plot points. Patient: Eva taught herself patience by preparing herself to confront the Mountain Folk through years of training, and by waiting for the opportunity of vengeance to present itself naturally. Her patience has carried over in other areas of her life. She is content with what she has in life and lets gratification come naturally instead of seeking it out herself. She treats her family, Council brothers, and allies kindly; understands the value of perseverance; and enjoys meaningful conversations regardless of their length. Perceptive: Eva is intuitive and can draw accurate conclusions based on her observations. Her heightened sense of magic allows her to detect the presence of magic and other magical beings, and to assess situations based on what she senses. She also recalls bits and pieces of information to see the bigger picture. For example, Eva notices tics in Aurek’s behavior and notices the unusually high activity of the Mountain Men’s messenger birds – and when she finally deciphers the map’s runes, she realizes what secrets he may have been hiding from the Council. Persistent: Persistence was key for Eva to prepare herself for one day getting her revenge against the Mountain Men. Once she decided, she sought out the right Faerie instructors to train in her combat, magic, and Mountainspeech. She also avoided certain activities and studies so she could invest time and energy in her training. During the novel, Eva applies persistence in more positive manners, from seeking out ways to gain Aurek’s trust to enlisting the help of her Council brothers to accomplish certain tasks. Protective: Eva’s protectiveness comes as a direct result of her parents’ deaths. She wishes to protect her loved ones and her people – a goal she can fulfill as part of the Council. She also worries about Aunt Maji and Uncle Lusan when she’s away on Council duties, and frequently writes letters to her aunt during those times. When it’s Eva’s turn for the night watch, she employs her magic to sense out intruders or animal predators. She also shows her protectiveness by teaching defense skills to Willem, a young Mountain Boy and her travel party’s horse caretaker, and by using her powers to rescue her travel companions. Simple: Eva owns few possessions and feels most comfortable wearing her Council travel clothes (dark green tunic, brown trousers, brown leather boots, leather belt for carrying weapons, a pouch, etc.). She ties her hair back to keep it out of her face, and she wears no feminine accessories except for an amber ring that once belonged to her mother. Talented: Eva has numerous talents – magic, archery, languages, and hand-to-hand combat being her most notable talents. These skills equip her not only for Council work, but also survival in the wild and more casual interactions with foreigners. Her talents have also made Eva aware of her image in the eyes of her people, as it doesn’t align with traditional expectations of Faerie women. 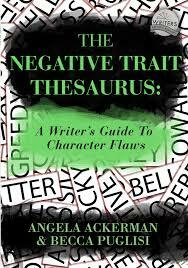 Cover of the “The Negative Trait Thesaurus,” also used as a reference to create Eva’s character profile. Insecure: Thought confident in many areas of life, Eva remains insecure about herself as a Faerie woman and about her future. She believes no Faerie man will want to marry her, a belief that further fueled her decision to try out for the Council. When not with the Council, Eva often keeps to herself or seeks the company of Aunt Maji, Immer, or Thrush. She also avoids public activities in Kasiarlena (the capital of the Faerie kingdom and where Eva lives), except when the Council is required to attend. Evasive / Prejudiced: The murder of her parents and the injury to her wing sparked Eva’s hatred for the Mountain Folk. When she decided on vengeance, she began building her life around that goal but managed to keep it a secret from everyone in her life, using other reasons to mask her plan. She studied virtually every aspect of the Mountain Folk’s lives (language, culture, etc. ), but never developed an appreciation or respect for their kind. Other motives later drove Eva to try out for the Council, forcing her to hide her dark secret even deeper. Therefore, she’s careful not to let her desire for vengeance rule her life – until the Mountain Men arrive in Kasialonen. Vindictive: Despite her station as a Council member – a position in which she’s supposed to embody Fae values and ideals – Eva is bent on avenging her parents’ deaths. She had set her plans long before the novel’s first chapter, and she’s conditioned her thinking so she believes she can get away with killing Mountain Men without shaming her people and revenge will bring her peace. Fortunately, Eva’s able to set aside her thirst when the Council is tasked to join the Mountain Men on their mission north – but it only takes Aurek’s betrayal to swing her back to her dark side. Volatile: Eva’s explosiveness emerges when the Mountain Men arrive, with Aurek receiving the brunt of it. (Think arguments and physical confrontations.) One plot point in the final third of the novel shows the consequences of such volatility. Eva realizes the harm she’s about to cause not only to Aurek and the Mountain Men, but to her family, the Council, her people, and herself. The remorse, shame, and self-loathing Eva feels afterwards drives her to the brink of self-punishment. What do you think of the protagonist? Is she someone you would like to read about? What do you think about her mix of positive attributes and flaws? Let me know your thoughts by commenting on this post. Until Then: Mini-Review Mondays will return soon, with my thoughts on Vanishing Point’s Distant Is The Sun and Stream Of Passion’s A War Of Our Own. I’m also working on a review of Die So Fluid’s The Opposites Of Light, which (as previously announced) will be my final review for Sonic Cathedral. Sara, I’m so impressed with the work you’ve put into Eva’s background and character building. It sounds like you’re really digging deep and coming up with realistic traits that match her history and contribute realistically to her personality. Bravo! I can’t give you and Becca enough credit for the amazing word you’ve done in your thesauri. They’re a treasure trove of information, and I know I’ll use them to create similar profiles for other characters in the WIP. Thank you for all you do! Firstly, I’m honestly astounded at how much detail you’ve managed to work into this already. This is…well, like becca said, impressive. Really impressive, in fact – especially given that you’re still in the first draft draft stage. I’m guessing not much will change with the world or characters when you redraft, compared to how a lot of projects go. And yes, I would very much be interested in reading about Eva. I particularly like how perilously close she is to becoming the villain of her own story. Sure, she has a lot of virtues, but if the wrong thing happens at the wrong time then I could easily see her losing it completely – something sure to make for some very tense reading, I’m sure. About the beginning of your post: LOL! Like I said when I responded to Becca’s comment, I was a little afraid I’d gone overboard in the profile. But I’m glad you enjoyed it. 🙂 I’d already outlined most of the plot before I began writing the first draft; and because of that outline as well as the separate backstory / appendices work I’ve been doing, I think I’ve gotten to know Eva pretty well. And I need to, since the WIP is from her first-person perspective. Oh, yes. In some ways, Eva is her own worst enemy. And that is going to come out in the book. The trick will be to make sure her flaws don’t pop up so often that she becomes unlikable. There will be other antagonists, too – including the parasitic one I’ve hinted to you before.